Raia of course last year remains the subject of much discussion when his name came up in the infamous Carmelo Garcia Rat Tapes. At a lunch Garcia was secretly taping he spoke about hundreds of vote-by-mail ballots drowning in a basement accident. Some discount this as an urban legend being that the vote-by-mail numbers were at staggering highs from that part of town which is campaign prone - the Hoboken Housing Authority. The numbers were in the area of 800.
Who's taking the over and under bet on the Timmy Occhipinti campaign on that number? MSV is going to say whatever final tally comes in, it will be staggering - even with Timmy's meth lab "campaign worker" unavailable this election cycle. 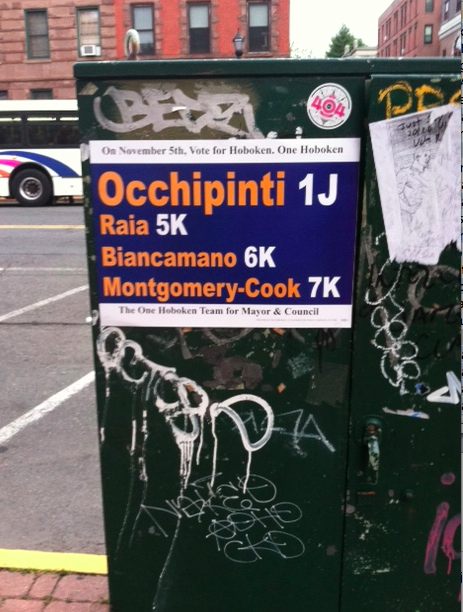 An illegal sticker is spotted posted on 9th and Washington Street for the Raia-Mason slate. 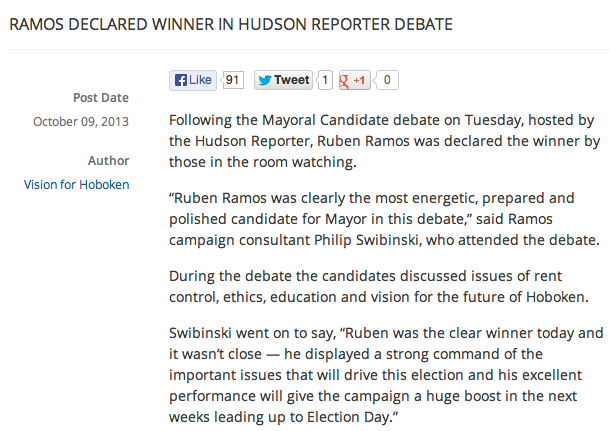 will bestow on Hoboken if they get control of the City Council in November. Last, thanks for all the folks leaving election stories tips in the comments section and via email. But boy, you guys are getting tough to keep up with! Seriously, an impressive and well informed readership - that you are!